When [% 11985 | | Windstar %] cruised out of Tahiti, it left a trail of disappointed cruisers in its wake. Travelers who hoped to experience the romance of sailing on a masted ship around the Polynesian islands had no more opportunities to do so. Until now. Following the line’s first Panama Canal cruise, Star Clippers is sending the Star Flyer to Tahiti. Star Clippers runs a fleet of tall clipper ships—smaller than Windstar, but equally romantic. The Star Flyer will spend three weeks in dry dock in Panama, before heading to Papeete. 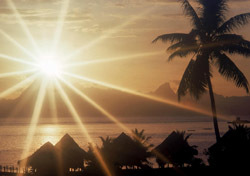 Its first official Tahiti cruise sets sail on December 30. Star Clippers will offer seven-, 10-, and 11-night itineraries in French Polynesia. The shorter cruises feature calls in Huahine, Raiatea, Taha’a, Bora Bora, and Moorea. The longer voyages include visits to the Society and Tuamotus Islands. For more information or to book a Tahiti cruise, visit Star Clippers’ website, call 800-442-0551, or contact a travel agent.